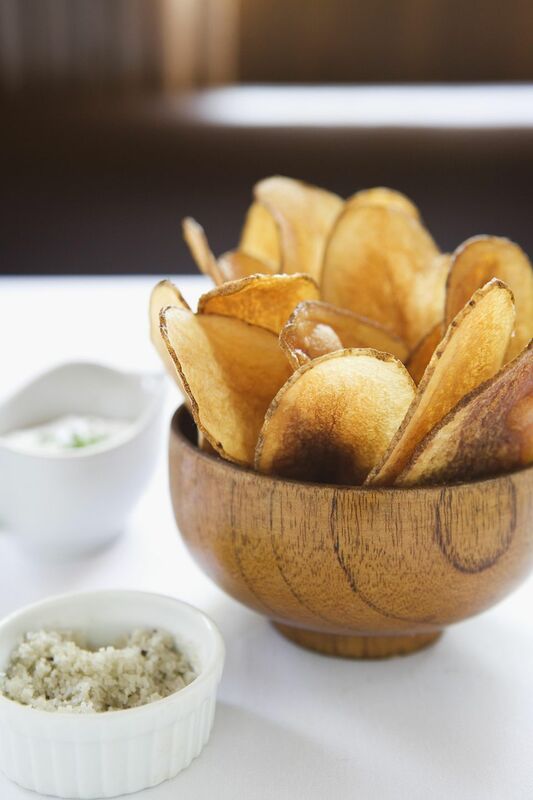 This is a simple recipe for grilling up some fantastic potato chips. Make sure that the potatoes are sliced very thin or you'll just end up with grilled potatoes. Try as an appetizer or as a side dish. Perfect for summer parties and game day gatherings. Use either a mandolin slicer (Buy on Amazon) or sharp knife to cut potatoes lengthwise into very thin slices. Place in a large bowl and coat with olive oil and salt. Place a grill pan on grill and allow to heat. Place potatoes on pan forming a single layer. Allow to cook for about 5 minutes per side or until browned. Keep a close eye on the potatoes as they are prone to burn if left on for too long. Repeat process with additional potato slices. Combine mayonnaise, lemon juice, minced garlic and a pinch of salt. Taste to make sure the flavor is to your liking. Make any adjustments necessary. You can prepare aioli ahead of time and store covered in the refrigerator. Serve with grilled potato chips. The mixture will stay good for up to 3 days after preparation if stored in the refrigerator.